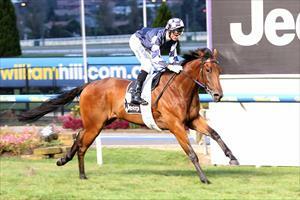 Once Zahspeed was able to gain an easy lead and into a rhythm the race was over according to jockey Glen Boss in the $80,000 Tour of Victoria Middle Distance Final (2040m) at Moonee Valley tonight. "As soon as the gates opened he was never going to get beaten," said a confident Boss of the gelding's powerful four-length performance. "This is a good horse, he just loves bowling along in front and he is able to travel at such a strong speed that he really gives his rivals no choice. "I expect he will be able to better races than this in the future." Trainer Danny O'Brien said a plan to give the horse a prolonged spell after his three-year-old season at owner Steve Pitts' Nug Nug Farm was the key to the gelding's strong form as he made it two wins and a second from his four runs this preparation. "He always showed us good ability as a three-year-old, but he did have a long campaign and it was important we gave a progressive staying type like him time to rest, mature and develop further and we are seeing the benefits of that now," O'Brien said. "It really was a commanding performance and he has a nice future ahead of him."